One of the best things I have enjoyed in the last few years is finding others who like sharing their opinions about films. The whole process of using social media and blogging has connected me to several writers on line that I follow regularly. Most are not film professionals nor do they aspire to be. They are passionate enthusiasts of a medium I have loved all my life. They have opinions and ideas that they feel compelled to share with others, and I am usually happy to read them. While I occasionally disagree on some level with them on a particular film or genre, most of the writers I follow are committed to having a friendly dialogue about movies. I am not shy about getting into an argument, but a dispute over opinions is just that, and does not necessitate a flame war. I much prefer to be inspired by the voices out there in a positive way as I am with this post. My movie memories are a big part of why I write about films. I like to think I understand a little about story telling thru film, but more than that, this is an opportunity to document my feelings and impressions. I suppose that is a little narcissistic, but all good conversations start with some sense of narcissism, we think others might give a damn about what we think. 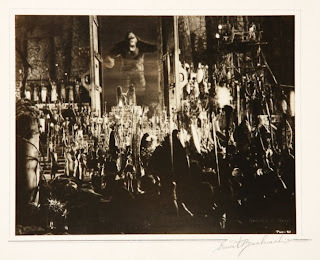 So I am inspired to write about the three King Kong films because one of the writers I follow devoted three posts to King Kong movies in the last few days and I want to piggyback on the idea. He stuck to the movies he saw on Thanksgiving marathons on the East Coast. Out here on the West Coast, Thanksgiving Day Marathons were devoted to the Twilight Zone, but I could easily have settled in for a Kong Thon before my turkey and dressing. For someone devoted to movies like I am I must confess it is hard for me to remember my first film. I know my parents took me to 101 Dalmatians right before my brother was born and I have a vague recollection of the experience, thought I would not yet have been four. I do know that by the time I was six, I had seen King Kong, the 1933 classic. I know because we went to the World's Fair in New York in 1964. 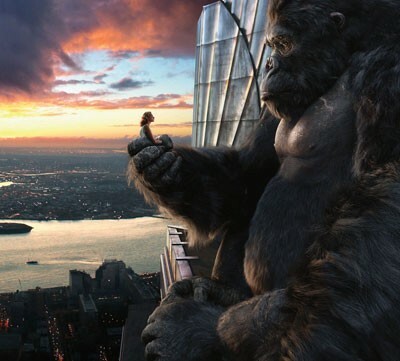 It was my first time to the Big Apple and I kept looking for Kong on the Empire State building whenever we went out. I remember my mother pointing out the World's Tallest Building (at least I think it was at the time) and telling me to look for Kong. A kid of six takes such advice seriously and I was disappointed that he never showed up, even when we went to the top to check it out. 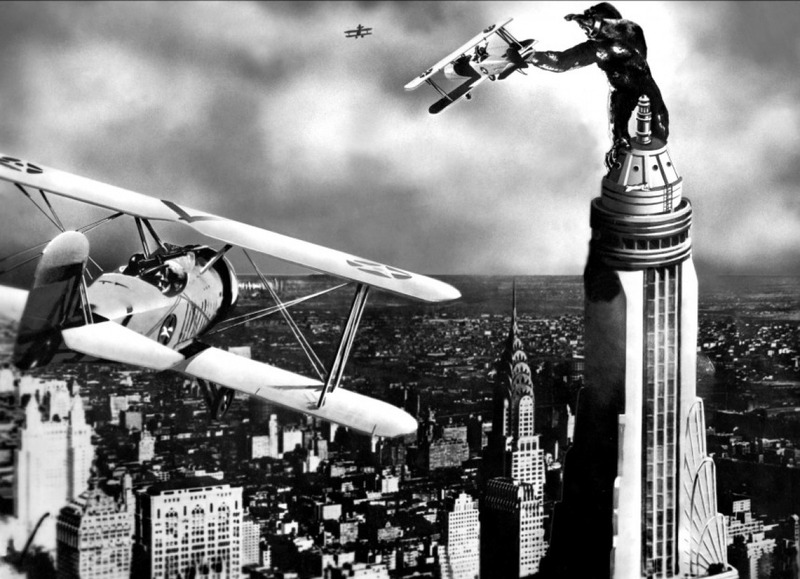 The image of the giant ape climbing the skyscraper is one of the iconic moments in cinema history. It has been lampooned and appropriated for a thousand ads, sketches and performances. At the end of "The Rocky Horror Picture Show", as Rocky climbs the RKO Antenna tower with Frankenfurter on his back, the defiant fist pump is a salute to the 1933 original. I have written before about my desire for emotionalism in movies. I don't need the irony and coldness of most modern motion pictures. I can take it and enjoy it for what it is, but I like a movie that thrills me, frightens me, makes me laugh or cry. King Kong did all of those things for me when I was a kid. I remember having a nightmare about Kong reaching in his big paw and pulling me out the window. I know I sat on the edge of my seat with a pillow over my face as a kid, watching Kong fight the T-Rex on Skull Island or roll dozens of men off of the giant log that spanned a crevice over which they were pursuing him and then escaping him. I remember two vivid emotions of anticipation in the film before they ever reached the island. Carl Denham is in New York, at the depths of the depression, seeking a woman to take to the island to film his movie. He meets Ann Darrow and gets carried away in recruiting her. " It's money and adventure and fame. It's the thrill of a lifetime and a long sea voyage that starts at six o'clock tomorrow morning", he nearly shouts at her in the diner. That over the top moment thrills me to this day. He is a grown man, excited beyond his ability to contain himself and throwing his whole heart into the adventure. At that moment, I knew I could never resist the siren call of King Kong. The acting style must be thought of as quaint now a days, but to me it has the heart that drives the picture in it. Later on the boat, when he is testing her for photographing and costume, he gives her this direction "Throw your arms across your eyes and scream, Ann. Scream for your life", and that is probably when I learned of foreshadowing in movie story telling. As a kid I always loved the movies of Ray Harryhausen, stop motion is the most amazing special effect because you can see all the work that goes into it. Willis O'Brien was chiefly responsible for Kong, and the effects while dated still work if you are willing to watch without the jaundiced eyes of a hipper than thou modernist. Just as the dialogue, and set design and treatment of primitive people is of it's time, so are the effects. Films had only had sound for six years when this came out. I can just imagine how audiences of the time were thrilled by it. I once saw what was purported to be the original armature of Kong at a museum exhibit, it looks like it was probably not the main piece but I am still happy to have had a chance to see the detail that went into producing the greatest special effects character of the first half of movie history. The horror of Kong breaking through the giant gate on Skull Island is still pretty vivid. The native child screaming and the mother rushing to grab him before Kong crushes them. Others are torn to bits and chewed up and spit out. Later when Kong arrives in New York and breaks free, I saw the terror in the eyes of the passengers on the elevated train as Kong smashes the track they are riding on. 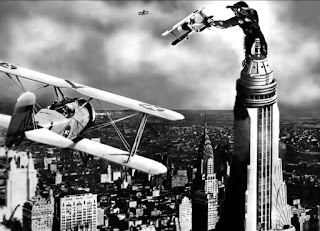 Who can forget the image of the bi-planes attacking Kong, who has become a sympathetic creature due to his love of Ann? The slow motion collapse of the mighty ape on the Empire State building brings a gasp of pity for the creature that previously inspired terror. That is great movie making. Forty plus years later, someone got it in their head that a remake of the classic would be a good idea. To be honest, the idea is nearly a sure thing because the story is so easy to relate to . Beauty and the Beast, with a giant ape in Manhattan, it practically writes itself. The year I started college, while home during the Christmas break, my family came across a full page ad in the newspaper, announcing the "Most Exciting Original Motion Picture of All Time" to be released one year from the day. My Dad and I were transfixed by the image of Kong astride the twin skyscrapers of the World Trade Center, battling jet aircraft. There was a poster premium we could order. I don't remember if it was cereal box tops or coupons from some other product, but we immediately sent off for the poster reproduction of that Newspaper ad. We got two mini posters a few weeks later and that poster stayed on my bedroom door until after I was married and moved out of the house. I wish I had remembered it before my Mom cleaned out my old room. I could go and look for it in the garage but I know I will never be lucky enough to find it. Many disparage the 1976 version of Kong, but I think it is perfectly serviceable and it has a few extras that were missing from the original. Mostly that consists of Jessica Lange being fondled and disrobed by Kong but what the heck. As a film it was quite successful financially if not always artistically. My hometown paper the L.A. Times gave it a very positive review and when my family saw it together that Christmas it came out, we all enjoyed it. The special effects to me are a step backwards. Despite spending a fortune on a full sized mechanical Kong, they had to rely on the old Japanese standby of a man in a suit. Of course the man was Rick Baker, who invented modern effects makeup, and the suit was not some cheap guerrilla costume from Hollywood Magic, but a nicely designed costume with an elaborate set of mechanical effects for facial expressions. The giant mechanical hand and the detailed facial expressions of Kong in this movie are the selling points. There is not really much in the oil plot line, and the New York sequences don't have quite the thrill of 1933. While I have seen the film from time to time since then, it is not a version that I own and it has been a few years since I revisited it. As much as I did enjoy it, I do remember that I stayed away from the sequel a couple of years later, "King Kong Lives", it just did not have the romance that the original story evoked in me. Peter Jackson's King Kong from 2005 is a movie that I anticipated almost as much as the Lord of the Rings films. Jackson is a bit of a nut on King Kong and he wanted to bring all the technical innovations of the last twenty years to bear on the object of his affection. I watched the web videos and followed the progress of the movie with great care. When the trailer appeared in theaters, I fell in love with the tone and the vision of the movie. It was a throwback to the 1933 film, a period piece with romanticism and adventure galore. I still love the movie but it is easy to see it's flaws through the rearview mirror. The movie is epic in scale and it takes it's time to tell the story. Jackson can't stop adding material in the second act, and the first was more elaborate than necessary. I do think that the final act is really strong and Naomi Watts lives up to the spell cast by Fay Ray and Jessica Lange before her. The park sequence on the frozen pond is a sweet moment that makes the sacrifice at the end even more bitter for us. For all it's excess, the 2005 version of Kong has it's heart in the right place, on it's sleeve for all of us to see. Nothing can ever top the original, but that's because it is so perfect. All three of the movies do their best to show us the eighth wonder of the world. They are all hyper emotional and romantic in different ways. I dragged my family to a midnight screening of Peter Jackson's Kong and it is a memory that we will all be able to share, regardless of evolving opinions of the film itself. My kids will recall the foggy eyed moment of walking out of the theater at 3:30 in the morning, just as I remember searching for Kong through the back window of our station wagon driving into NYC in 1964, or staring at the mini poster on the wall that my Dad and I so much wanted to get when we saw the ad in the paper. The promo for that film could apply to all three versions. "The Most Exciting Original Motion Picture Event of All Time", OK, of all three times. "It was a throwback to the 1933 film, a period piece with romanticism and adventure galore"
You nail it on the head with that comment; this movei was just that. You got it. By the way I am still working the outlines so don't fret yet. Oh ok, sorry about that then, thanks, and see you tomorrow. 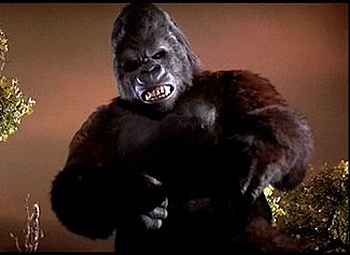 KING KONG LIVES (1986) was so disgustingly bad, it wasn't even worth a negative mention from me. Were we honestly supposed to believe that after being completely massacred atop the World Trade Center and then falling to his death from 110 stories, that he was kept alive for 10 years with machines and medical equipment??? That's about as acceptable as a great white shark following Lorraine Gary around the globe to the Bahamas (or was it Jamaica?) in JAWS: THE REVENGE (1987)! Yay! I am glad you liked the 2005 version and Watts's performance, too. I loved this line: "At the end of "The Rocky Horror Picture Show", as Rocky climbs the RKO Antenna tower with Frankenfurter on his back, the defiant fist pump is a salute to the 1933 original." I love that as well in RHPS. "Whatever happened to Fay Wray?" A whimsical wish for the low budget horror film (a parody of itself) from RKO days.